JoJo is a friendly but rather petite pup who, because of his size, could be mistaken for a girl. This is a positive characteristic for those persons who like a male but fear that one might be too big for their particular home situation. 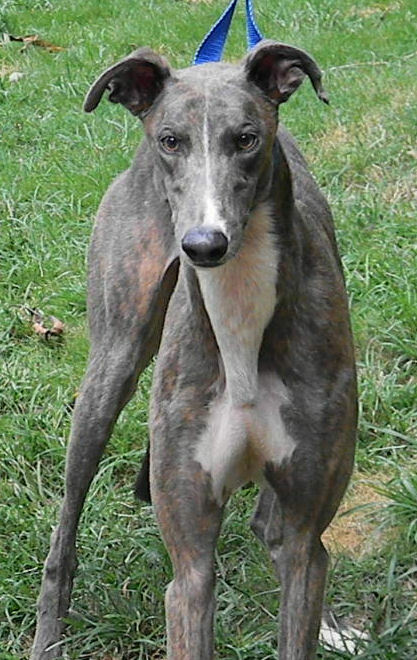 In addition, blue Greyhounds are the rarest of the breed (possibly because there is some thinking in the industry that they just don’t make good racers) and, thus, are often much sought after by adopters. 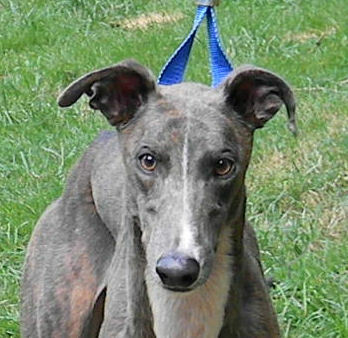 While classified as a blue brindle, JoJo is actually quite blue. And with his narrow white blaze and big white chest, he is certainly striking-looking. For whatever reasons, JoJo never set foot on a track.